Soleil Laurel Canyon is an active adult community located in Canton, Georgia. Nestled ideally between the North Georgia Mountains and Atlanta, this master-planned community has ideal access to outdoor recreation. Soleil Laurel Canyon's close proximity to Canton's Riverstone Parkway also means quick access to Atlanta's superb cultural, sports and medical facilities, as well as a large variety of shopping and dining options. This 55 and over community has an incredibly spacious clubhouse with an array of amenities not seen in comparable communities. Soleil is also adjacent to The Fairways of Canton Golf Course in Laurel Canyon. This 18 hole, par-71 course is a favorite activity among many residents. 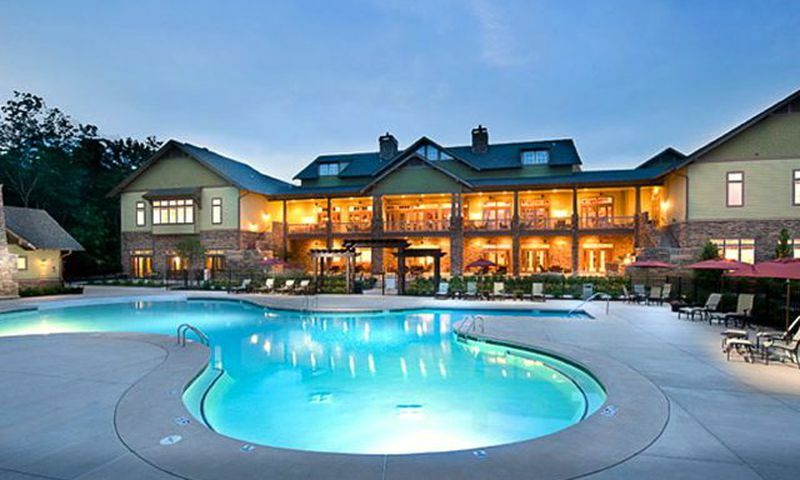 The 28,000 square-foot craftsman-style Grand Clubhouse contains a fully-equipped fitness center with aerobics studio, private massage rooms, and heated indoor saline lap pool. There is an arts and crafts center with two kilns for the hobbyists, a theater and performing arts center, an elegant library with billiards, two card rooms for rest and relaxation, and a gourmet teaching kitchen. Outdoors, Soleil Laurel Canyon's residents can take a refreshing dip in the zero-entry lagoon-style pool, which has an expansive patio for lots of leisure time. For outdoor activities, there are six clay and two all-weather tennis courts, and two bocce ball courts. A magnificent amphitheater overlooking a lake is the center of outdoor entertainment at Soleil Laurel Canyon. Beautiful walking trails, a lake-side gazebo, and the on-site community garden are sure to appeal to nature lovers. Additionally, residents can enjoy 18 holes of golf on the adjacent Canton Golf Course and Club. Construction of Soleil Laurel Canyon started in 2007 by Levitt & Sons and continues today by Active Lifestyle Communities. At completion, 978 single-family homes will comprise this gated community. New construction homes are available from Active Lifestyle Communities, along with various resale homes from Levitt & Sons. Active Lifestyle Communities currently offers nine models ranging from 1,418 to 2,813 square feet. Models have have two to three bedrooms, two to two-and-a-half bathrooms, and an attached two to two-and-a-half-car garage. These homes were designed with active adults in mind with well-designed floor plans and low-maintenance exteriors and are available on a new and resale basis. Levitt & Sons floor plans are currently available on a resale basis only. These models range from 1,518 to 2,996 square feet of living space with two to four bedrooms, two to three-and-a-half bathrooms, and an attached two-car garage. Some of these models offered second floors lofts however all models have convenient first-floor master suites. Residents of Soleil Laurel Canyon have the opportunity to enjoy world-class amenities and an active lifestyle. Not only are the numerous on and off-site amenities luxurious, there are two full-time activity directors. In addition, over 50 clubs catering to a large variety of interests are already established in this growing 55 and over community. Some of these clubs are health and wellness group, current events, Monday night football group, dance classes, Veterans group, chess club, cultural arts and education, men's breakfast group, personal training, Soleil Singers, Les Marmiton, Canyon Cookers and many more. Canton, Georgia offers plenty of shopping and dining, along with ample opportunities for culture and recreation. Heritage Park, Boling Park, Canton Theatre, Lake Altoona Beach, Kennesaw Mountain Battlefield and Merchant's Walk Library are all worth a visit. At a mere 40 miles away, Atlanta is a popular destination with Soleil Laurel Canyon residents as well. The greater Atlanta area offers attractions for all ages. Some of these are the Centennial Olympic Park, Georgia Aquarium, Margaret Mitchell House and Museum, Sandy Springs Historic Site, and Stone Mountain Park. Atlanta is also home to the William B. Hartsfield International Airport, which makes it convenient for long distance travel. Grand Clubhouse - 28,000 Sq. Ft. There are plenty of activities available in Soleil Laurel Canyon. Here is a sample of some of the clubs, activities and classes offered here. Active Lifestyle Communities currently offers nine models ranging from 1,418 to 2,813 square feet. These homes have two to three bedrooms, two to two-and-a-half bathrooms, and an attached two to two-and-a-half-car garage. These homes were designed with active adults in mind with well-designed floor plans and low-maintenance exteriors. These models are available on a new and resale basis. The Aqua Collection offered five models ranging from 1,518 to 1,994 square feet with two to three bedrooms, two bathrooms, and an attached two-car garage. These homes were among the smallest homes built by Levitt & Sons or Active Lifestyle Communities and are available on a resale-only basis. The Natura Collection built by Levitt & Sons or Active Lifestyle Communities offered five models ranging from 2,057 to 2,359 square feet with two to three bedrooms, two bathrooms, and an attached two-car garage. These models are available on a resale-only basis. The Ventus Collection models were among the largest homes built by Levitt & Sons or Active Lifestyle Communities. These models offered 2,540 to 2,996 square feet of living space with two to four, two-and-a-half to four bedrooms, and an attached two-car garage. Some of these models offered second floors however all models continued to have first-floor master suites. These are available on a resale-only basis. As Premier Agents for 55Places, we have helped over 50 homeowners either build or purchase a resale home at Soleil in the last couple of years. We currently have 8 future homeowners building at Soleil; all are happy with the process and we know you will be too! What a community!! Actually it is like a little city. We have been here 4 months and love it. Our home is beautiful and handicap friendly. There are so many things covered under the HOA fees. I woke up one morning and landscape people were spraying my yard for weeds and pulling them! Thought I had died and gone to heaven... We have attended 3 musical entertainment shows and have been pleasantly surprised with the quality of the outside entertainers that were brought in. Participation from residents ranged from 100+ to almost 30, and people here love to dance. There are lots of clubs to join and an incredible # of activities. The homes look small on the outside, but they are deceiving. Lots of home inside. Everyone is friendly and you don't have to be retired to live here. People from all over the country have come to Soleil, so check it out if you want a peaceful area, with as much activity as you want or the ability to just chill. Buyer beware! Do your homework and understand what is planned for the entire community. Poor workmanship and lack of quality control. Ask a lot of questions and speak with people that live here...not the handful that Soleil wants you to speak. Go door to door and talk to people. Good luck! We fell in love with Soleil the first time we visited with a realtor who recommended it, We have been in our new home just over two weeks and we feel like we made the right decision. What's not to like?! It's a beautiful area and the neighbors are so friendly and welcoming! Have lived here about 4 months and could not be happier with our choice. The surroundings are so beautiful, the people we've met are friendly and helpful. The facilities go beyond our needs and wants. There is always something to do. We are happily here to stay. We just moved in to our brand new home here and absolutely love it! The house has everything we wanted like beautiful hardwood floors, granite countertops, large screened-in deck, plenty of storage and a great kitchen. The community is exactly what we wanted, if not more! The gated entry is a nice perk. The clubhouse is very upscale and has everything plus it is very well maintained and decorated. You can tell there is a strong sense of pride among the homeowners and we are excited to become more involved with the community! 55places.com is not affiliated with the developer(s) or homeowners association of Soleil Laurel Canyon. The information you submit is distributed to a 55places.com Partner Agent, who is a licensed real estate agent. The information regarding Soleil Laurel Canyon has not been verified or approved by the developer or homeowners association. Please verify all information prior to purchasing. 55places.com is not responsible for any errors regarding the information displayed on this website.